A leader in the study of Active Materials our beloved MCE Executive Officer, colleague, advisor and friend Kaushik Bhattacharya celebrates 27 years in the field and a 50th Birthday this year. This symposium celebrates his life, leadership and mentorship. 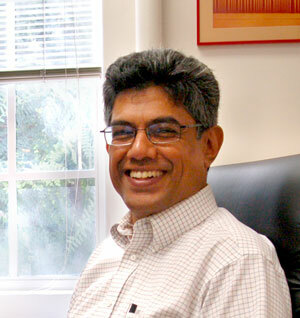 Dr. Bhattacharya’s current research concerns three broad areas: (i) Active materials such as shape-memory alloys, ferroelectrics and liquid crystal elastomers, (ii) Heterogeneous materials and designing unprecedented properties by exploiting heterogeneities, (iii) Coarse-grained density functional theory to understand defects in solids. Join us as we celebrate Professor Bhattacharya on Friday, January 9th in Hameetman Auditorium. 11:00 – 11:30 AM From bi-stable chains to proteins. 1:15 – 1:45 PM Long-Term Atomistic Simulation of Heat and Mass Transport. 1:45 – 2:15 PM Tensor-structured techniques for large scale Kohn-Sham DFT calculations. 4:15 – 4:45 PM A Dynamic Multiscale Phase-field Model: Regularized Interfaces with Transparent Prescription of Complex Kinetics and Nucleation.